So your looking to upgrade your current exhaust system, for that new custom look or maybe your seeking additional performance. The current exhaust market today offers a vast assortment of many different styles of exhaust systems. But maybe you have an oddball bike, or you just can’t fi nd exactly what you’re looking for. Never fear, you have a few options. You can pay someone to build a one-off custom exhaust or you can try tackling the project yourself. A common way to create your custom exhaust system is with the use of mandrel bent tubing. Mandrel bent tubing is widely available throughout the industry. With the choices of either steel, stainless steel and even titanium, it also comes in various thicknesses, but we commonly use 16 or 18-gauge tubing. 16-gauge being better suited for high vibration applications. 18-gauge is good for that lightweight high performance /racing application. 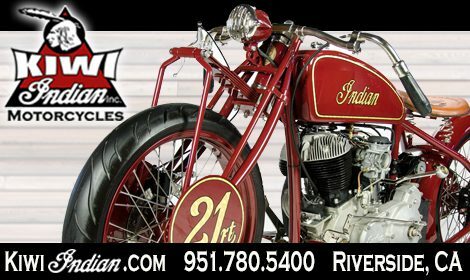 So, when it comes to creating your exhaust system you need to come up with a plan and your imagination is your only limitation here. However, I have personally found that in some instances the different radius mandrel bent tubing can be a limiting factor. Not being able to fi nd a tight enough bend or one big enough to create your design. One of the biggest issues I have seen when folks are trying to build their own custom exhaust system is they are typically cut incorrectly. The mandrel bends are available in different centerline radius, which means it’s a tighter bend or a bigger bend. 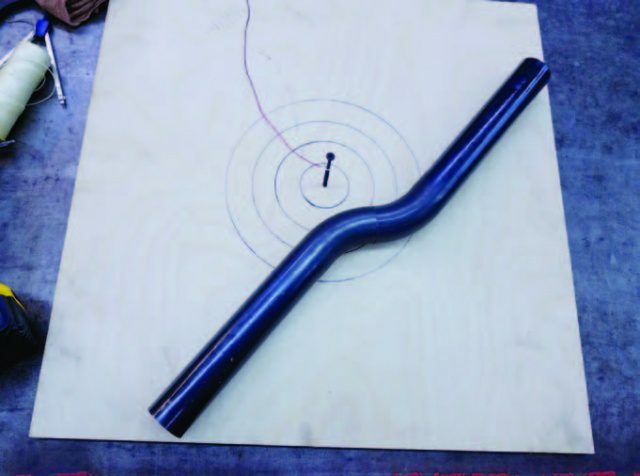 The centerline radius is measured from the centerline of the exhaust tubing bend. 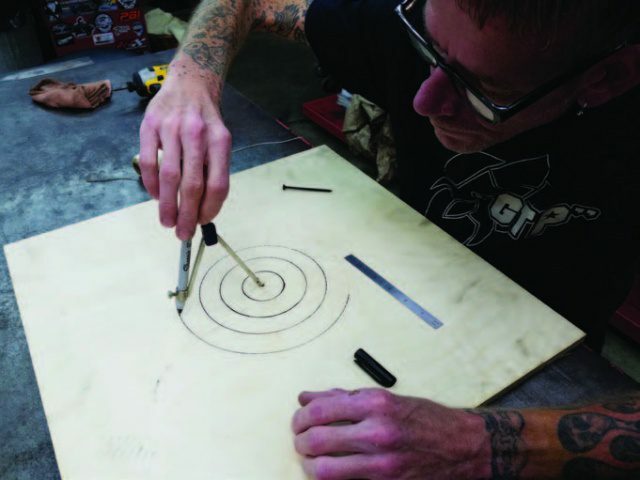 To be cut properly the tubing must be cut on the centerline of the radius. 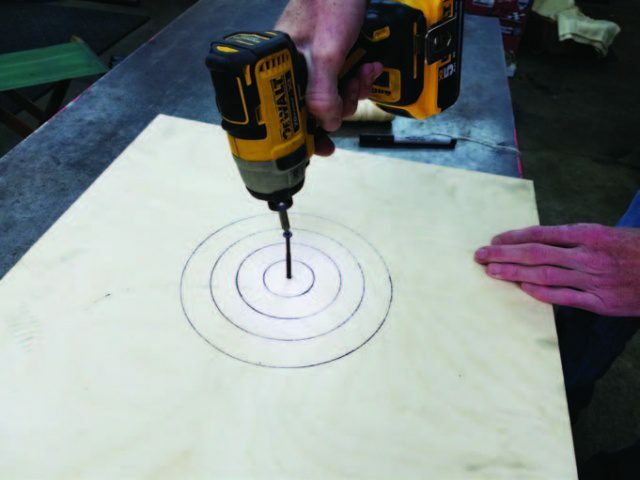 So, for this month’s tech I am going to show you a quick, easy and affordable DIY centerline radius marking tool. 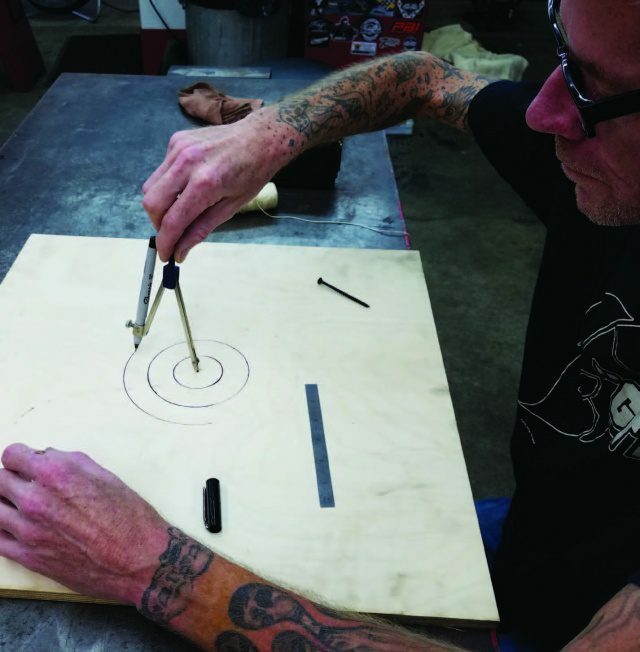 This tool will allow you to mark your mandrel bends for proper cutting and will provide you with a nice seamless free fl owing exhaust system. 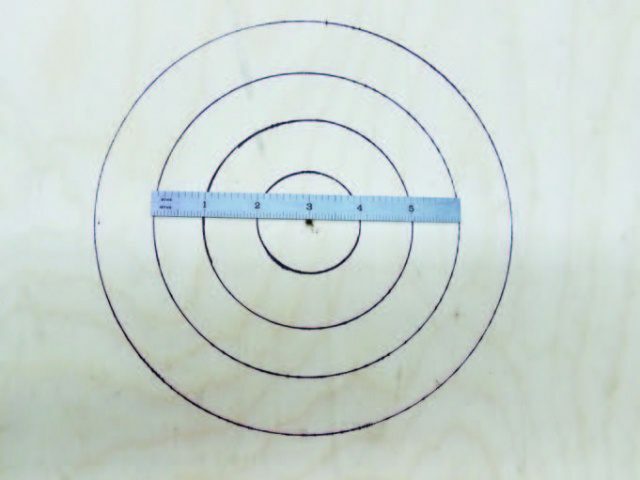 The material list is simple for this DIY center line radius marking tool. With a quick trip to the local hardware store I purchased a 2ft x 2ft x ½” thick piece of plywood for $2.79. Back to the shop I went, you will need a compass, pencil or marker, ruler, string, and screw. Basically, you are going to have less than $5 in this awesome tool! 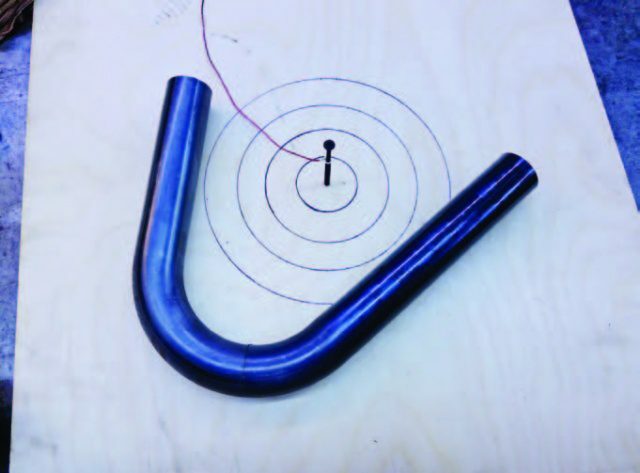 These circles will be used along with your “eye-crometers” to align your mandrel tubing bends. 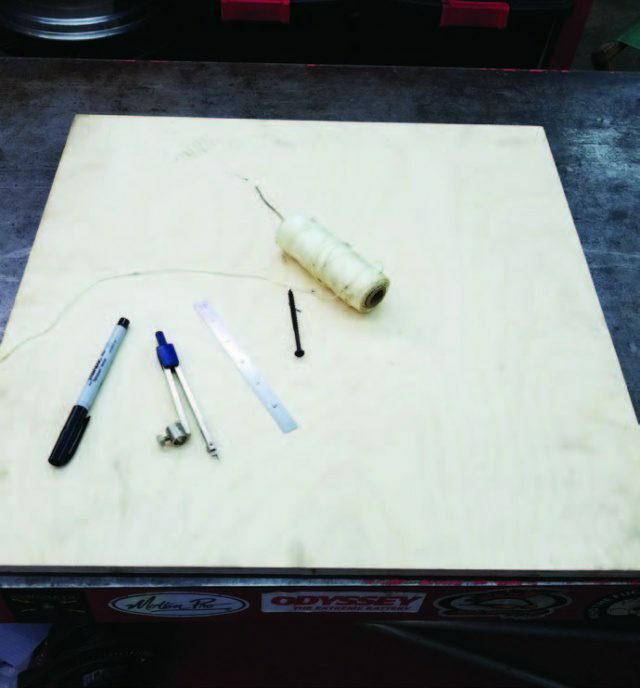 In the center of your board take a 3” to 4” long screw and screw into place. 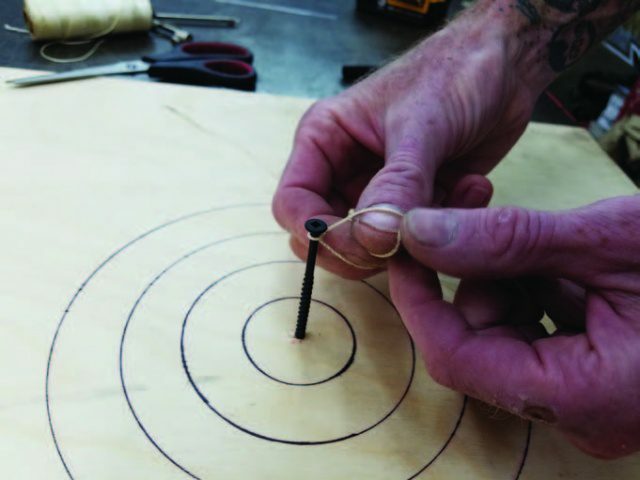 This screw establishes the centerline of the circles. portion of the centerline screw. 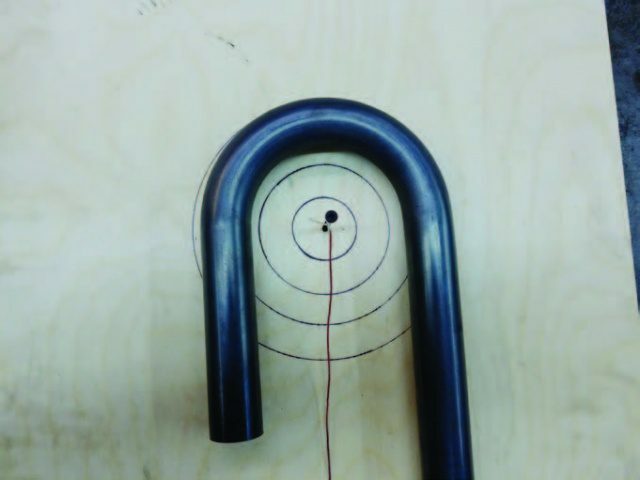 Here is an example of how you utilize the circles and your “eye-crometers” to properly position a piece of mandrel bent tubing. 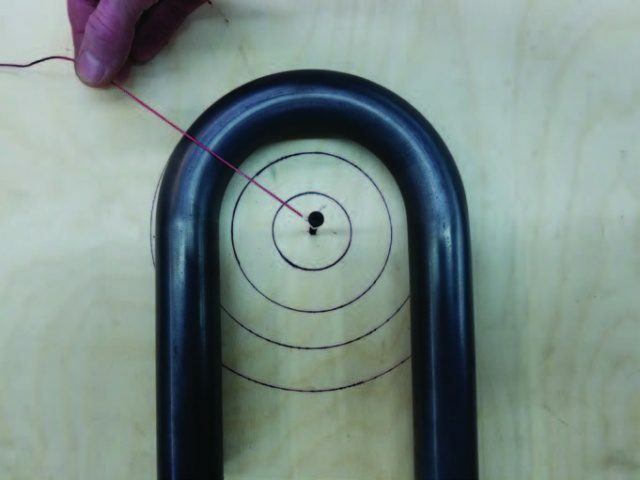 The circles are used as a guide reference here for positioning the bend. 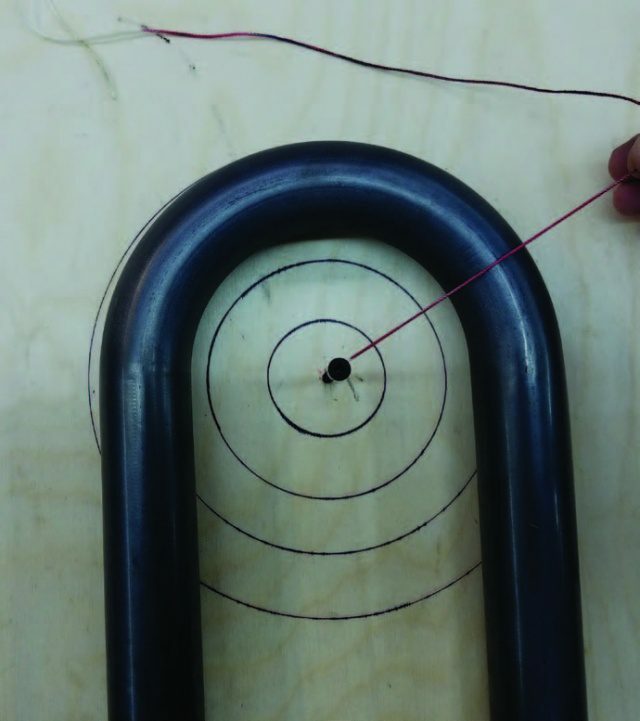 With the bend properly positioned using the circles as reference guides you can now pull the string taught and move it through the radius of the bend. At any position you choose, the string will be on the center line of the radius. 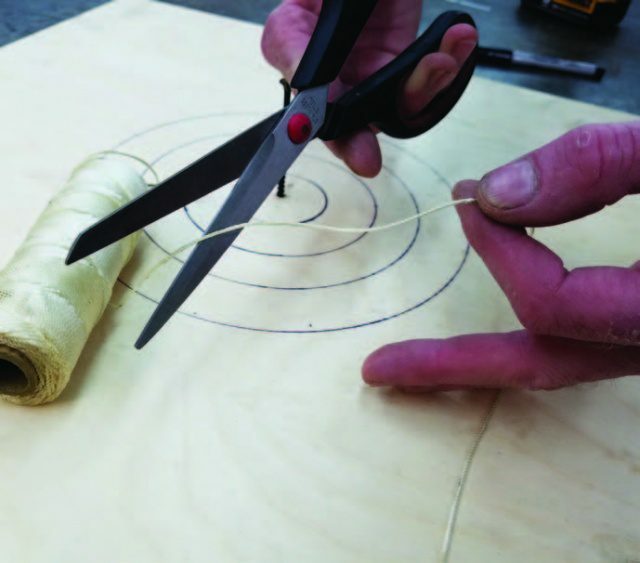 With the string pulled taught you can now mark your bend for cutting. This is the part where it will take practice with this tool. 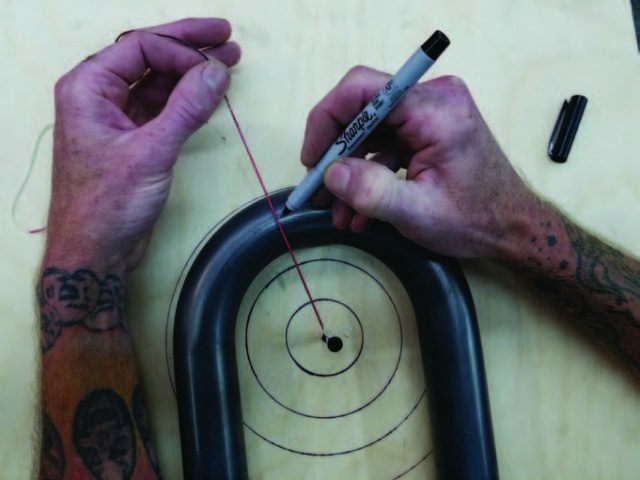 To fi gure out where you actually want to mark your tubing to achieve the proper cut for your design. achieves a seamless free fl owing cut that can be positioned in any way you want… There you have it, a $5 industry kept secret! Now don’t get me wrong, there is a large learning curve when using this too but with patience and practice you can make it happen! This year is my 7th year writing for Cycle Source and my 91st tech article so if there is something that you would like to see me do a Tech article on please call me or email me with your idea. 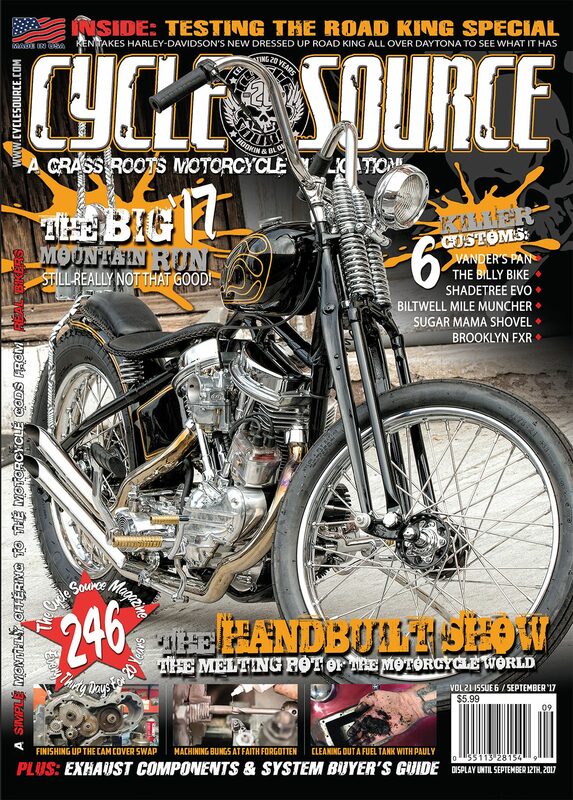 This entry was posted in Tech Tips/ DIY and tagged Back Issue, Cycle Source, Cycle Source Magazine, Daniel Donley, DIY, Exhaust, Exhaust Marketing Tool, October 2018, Pandemonium Custom Choppers, Tech, Tech Tips. Bookmark the permalink.